In January 2015, Mitsubishi Heavy Industries Group established Mitsubishi Motors Co., Ltd., and Hitachi Metals, Ltd., in which Mitsubishi Electric and IHI have capital participation, and "Plymetal Technologies", taking over the technology of Siemens in Germany. The world's leading iron and steel machinery company formed by the integration of Mitsubishi Heavy Industries and Siemens's steel machinery division: Plymetals Technologies, Inc. is responsible for the development, design, procurement, manufacturing, sales and after-sales service for steel machinery in general for the whole world. We are developing and providing services related to the manufacturing and maintenance of nonferrous metal related machinery such as aluminum. The current situation is "World share No. 2", but we are promoting global development with the aim of being the world's No. 1 steel machine manufacturer with a view to the global market. The equipment for steel making machines has a total weight of 10,000 tons, and a total length of 1 km. It is a plant that takes 2-3 years to complete. In order to operate such a large-scale facility, several projects are always in operation, and we continue to deliver top-of-the-art plants for customers in all industries worldwide. In total from the times of Mitsubishi Heavy Industries, Hitachi, Ltd. and IHI Metaltec, we have delivered more than 2800 plants worldwide. In addition to steel, our machines are active in nonferrous metal processing in various fields such as thin metal plates that are substrate materials for electronic devices, and all fields from construction to automobiles, electric products, and information devices We support a wide range of industries and products. · Design of rolling equipment (hot and cold), peripheral equipment design, process equipment, peripheral equipment design, etc. ・ PR activities, planning, and design of civil engineering and construction work, determination and proposal of basic plant specifications, estimate compilation, project performance management, etc. ・ A creative person who can grasp the needs of customers and society in a precise manner and produce products that can meet their needs. · Japanese: Conversation level is preferable but not required. Let's learn together! Our products have been delivered to many countries around the world, and we can engage in dynamic work that affects the world, such as national projects! Our company is a workplace where foreign students and foreign nationals are also active. There is also a cafeteria with a vegetarian menu and a halal menu! 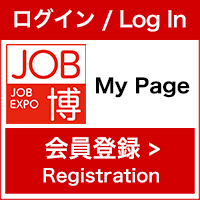 プライメタルズ テクノロジーズ ジャパン株式会社　選考会エントリーApply now!